As I have already posted, it appears that we may have a population of giant sloths in North America. It is an extraordinary creature and it appears to be solitary for now, but on the basis of less than half a dozen separate sightings, it is premature to make that statement. This last report posted two days ago was very important, not least because it once again provides an extensive collection of witness information. Their misfortune was that their cabin encroached directly on the territory of one of these creatures and they then triggered a response. First though, this creature is extremely dangerous in quite the same way that a grizzly is dangerous when disturbed. It needs to be observed with great caution. There are not a lot of these around, but you can bet their population is growing and they will become more noticeable. Until now it has been easier to assume a bear has been encountered and anyone unlucky to cross their path likely failed to survive. 1 It is fully furred and the fur is comparable to a bear causing natural misidentification from a distance. 5 It has a long snout and long fangs designed for tearing meat from game. I only have one report regarding fangs, but otherwise I still think the creature is normally a herbivore first in quite the same way as other sloths. It is quite possible that the giant sloth developed fangs in quite the same way as isolated populations of deer will develop fangs when ample game is available. In short, it is a killing machine from our nightmares that is wonderfully adapted to take to the trees when threatened and for gaining a perfect hide to stalk game. Now what else did we learn here? It is actually quite a lot. 1 It tears game apart in what may be described as a killing frenzy. This makes it particularly dangerous. 2 It eats some of the game and then caches the rest by burying it. This explains its interest in grave yards were it is able to smell decomposing meat. 3 It easily excavates a earthen den to den up in when sleeping. Because sloths need a long time digest plant material, it will typically slip into a month long dormant stage to do this. It has a much lower metabolism that we expect. Yet to prosper when it is about, meat protein is likely necessary. Winter may make it mandatory as these creatures have been possibly noted in New Hampshire. I will now make a major conjecture. Although fangs have been noted, the creature is poorly adapted for eating meat in other that gobbets torn of the carcass and also can only eat a small amount at one time. After all its metabolism is very slow. What it is able to do is eat maggots. Thus it creates individual caches of buried meat which is inevitably a breeding ground for maggots upon which the creature can feed. Thus we get the noted odor of dead meat around this creature. I want to note that maggots feeding on a carcass will take on the taste of the meat it is eating. This happens to also be used by the Eskimos at least occasionally in emergencies and possibly more often when a cache of caribou is left far too long. Thus we have a predator that needs to operate within a small hunting range that dens up most of the time and hugely extends the usefulness of a kill by exploiting the produced maggots. It is also nocturnal as are most predators. Thus it will be dened up during the daytime and considering the reports on its home ground, most interlopers would become nervous and be scared of. If one is hunting for such a creature, be certain to search up wind and look for the smell of dead meat. Never approach from the other direction. Way more important though, scout all trees around yourself from the top down. That is were it is most at home. This creature has not been hunted or trapped because it is too much for a lone individual to tackle and this would be sensed by an experienced bush man who would shy off just as these reports make clear. 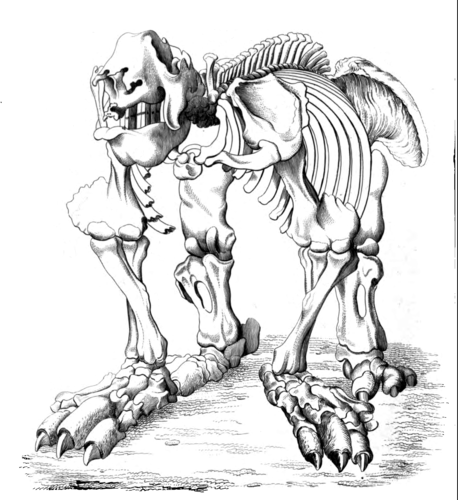 The skeleton of Megatherium, as figured in William Buckland’s Geology and Mineralogy Considered With Reference to Natural Theology. There is something fantastically weird about giant ground sloths. Creatures from a not-too-distant past, close enough in time that their hair and hide is sometimes found in circumstances of exceptional preservation, these creatures have no living equivalent. Their arboreal cousins still live in the tropics of the western hemisphere, but they can hardly be considered proxies for the ground sloths of the Pleistocene. The most famous of these ancient beasts was Megatherium, an exceptionally large ground sloth which has been fascinating paleontologists and the public for over 200 years, but what is less well known by members of the public is that there were many kinds of ground sloth. Megatheriumwas not a lone aberration but a part of a highly successful family, one of the few types of weird South American mammal that flourished in North America when the two continents came into contact a few million years ago. Not all of them were the same. While some made their living grazing in open habitats others preferred to browse among most forested environs, and a recent study published in the Journal of Morphology provides a way to tell which kind of lifestyle particular sloths might have had. 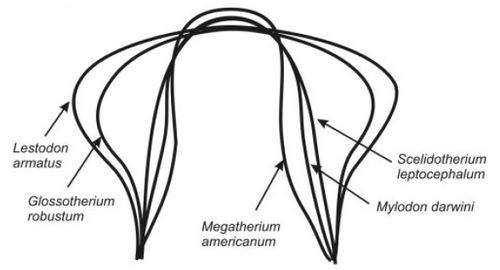 Restoring the head of Megatherium americanum. A) Skull B) Skull with nasal cartilage C) Skull with cartilage and muscles D) Full head restoration. From Bargo et al, 2006. Everybody knows that teeth can often tell you quite a bit about what an animal eats, but it is not the only informative parts of the skull when it comes to diet. To ascertain the range of dietary habits in giant ground sloths, researchers M. Susana Bargo, Nestor Toledo, and Sergio Vizcaino looked at the muzzle shapes of the species Megatherium americanum, Glossotherium robustum,Lestodon armatus, Mylodon darwini, and Scelidotherium leptocephalum, a selection with a variety of skull shapes. Two of these, Glossotherium and Lestodon, had squared-off muzzles, and the rest had more narrow snouts, but to determine how this related the diet the authors looked at the muscle scars and other landmarks in comparison with the known tissue anatomy of living sloths in an attempt to recreate the soft tissues of these animals. 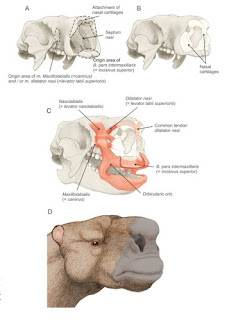 As illustrated by the restorations of the head of each sloth, figuring out their muzzle shape was a multi-step process. 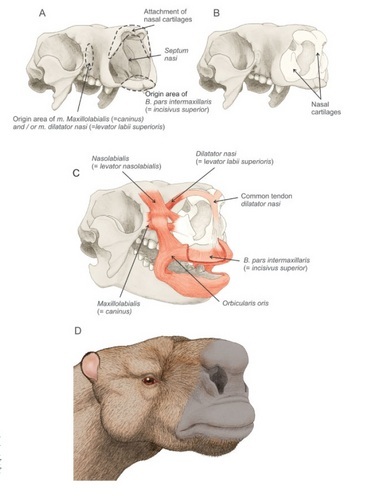 First was determining the extent of nasal cartilage that would have been present in life. This provided the complete framework on which to place the various muscles related to lip movement, and from there the head could be fully fleshed out. Once these restorations were completed it could be further hypothesized whether each species was a browser or grazer, with grazers being characterized by having wide, squared-off muzzles suited to taking in low-quality foods (i.e. grass) in bulk and browsers having narrower muzzles better suited to more selective feeding on high-quality foods. 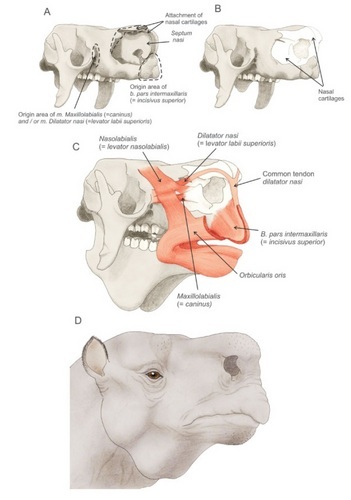 Restoring the head of Glossotherium robustum. A) Skull B) Skull with nasal cartilage C) Skull with cartilage and muscles D) Full head restoration. From Bargo et al, 2006. The results were fairly clear cut. Lestodon armatus and Glossotherium robustum both had comparatively wide, spoon-shaped muzzles, with Scelidotherium leptocephalum, Mylodon darwini, and Megatherium americanum having narrow muzzles (the latter species having the narrowest of all). Overlain on top of each other, there is a wide gap between the muzzle shape of the grazers and browsers; the sloths selected are not grades between one extreme and another but occupy opposite, well-defined ends of the spectrum. Additionally, Megatherium americanum may have been such a specialized feeder that it had a prehensile upper lip akin to what is seen in the black rhinoceros which it could have used to grasp and selectively tear off particular plant parts. The grazing sloths Lestodon and Glossotherium, on the other hand, would have had lips more like that of the white rhinoceros – squared off and better suited to bulk feeding. An overlay of ground sloth muzzle shapes, showing a clear division between browsers and grazers. From Bargo et al, 2006. The hypothesized feeding habits of these sloths are consistent with what is seen in living herbivores – browsers and selective feeders have narrower muzzles than grazers within lineages of plant-eating mammals. This may have been a form of niche partitioning as sloths evolved through the Pleistocene, and may explain why there were so many genera and species present at the same time. Even though we think of modern sloths as peculiar, specialized animals, the ground sloths of old appear to have been more adaptable to a wide array of habitats, though this makes their disappearance in relatively recent time all the more mysterious. Post script: This kind of niche partitioning did not only exist between closely related species, but could also happen within species as organisms grew up. A recently-described juvenile Diplodocus skull, for instance, suggests that young individuals were browsers while adult Diplodocus were better suited to grazing.